Glitter polishes are my favorite. I couldn't decide which glitter polish to feature, so I'm giving you three! First is the very affordable L.A. Colors "Goddess." This polish surprised me; when I first bought it, I just knew it would be stupidly sheer and take a million coats. Wrong! "Goddess" is actually an opaque glitter! It's gorgeous, and it only cost me $1. 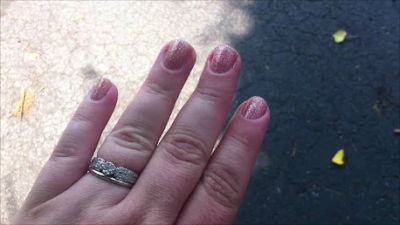 This is two coats in the shade because the images I took in full sun didn't show the polish's true color. "Goddess" is a great summer polish. It's a light golden color with different sized glitter. Just look at those big ol' honkin' silver hex shapes in the bottle! Next is another inexpensive glitter: "Ants in My Pants" by Spoiled. This is one of the CVS exclusive polishes, and I'm 99% sure it's a dupe of Wet 'n' Wild's "Behind Closed Doors" from the limited edition Halloween 2011 collection, which I'm 99% sure was a dupe of a fancy Deborah Lippmann polish. I took these photos at my Mom's house after doing yard work, so you can see some tip wear. Overall, though, the polish held up really well. And it is gorgeous. This is one coat over black. The only problem with this Spoiled polish, and with the other Spoiled glitters I own, is that the formula is so chunky it's like painting your nails with molasses. Don't care, though, because my crappy photos do not do this polish justice. "Ants in My Pants" is a sheer black jelly that is jam-packed with red hex glitter. ME GUSTA. 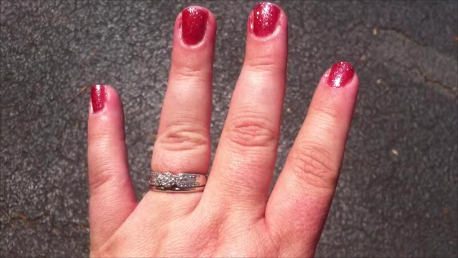 Finally, I have an expensive polish to show you: "Ruby Slipper" (yes, just one) by Del Sol. This is one of those color changing polishes, and of the several Del Sols I own, "Ruby Slipper" is by far the one that has the most dramatic color change. Here are before and after pictures. The "before" was taken in the shade, and the "after" was taken out in full sun. If you go to the Del Sol web site, the demo bottle of "Ruby Slipper" they have is silver glitter that turns red. Mine, though, is gold glitter that turns red. I don't know if I got a dud or what, but I like the change from peachy gold to red. I liked it so much I made a daggone video of it and put it on YouTube! See? Love Goddess!! It is such a pretty colour!! I've never used LA Colours before, I may have to pick a few up! !